Chain Link Fence Slats - Hedge Style | Hoover Fence Co.
Use our Chain Link Fence Slats in the Hedge Style to create a natural looking hedge that needs no trimming, maintenance, or water, all while providing approximately 90% privacy! This unique product features Blue Spruce colored PVC 'needles' whcih are UV stabilized to protect from the damaging rays of the sun. These Hedge Slats are constructed of a 16-gauge braided and galvanized steel wire core, with 3-mil PVC 'needles'. We are proud to offer this product for 3', 3-1/2', 4', 5', 6', 7', 8', 8', and 12' high chain link fences. Our Hedge Slats are sold in bags which provide approximately 10 linear feet of coverage (each bag contains 82 individual slats). 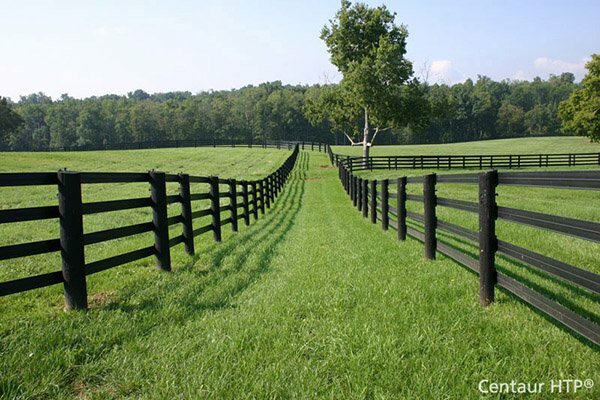 All slats are also approximately 2" shorter that the actual height of fence. To install, simply slide the slats down from the top, into the channel that is created during the manufacturing of the chain link fence fabric. The PVC 'needles' hold the slats in place. No special tools are needed, but a pair of Fence Pliers come in handy to straighten any wire that is deformed or bent. One a scale of 1 to 10, installation difficulty is a 2 (3 if you cannot reach the top of the fence). Note: The Hedge Style Chain Link Fence Slat is designed to work with a fence that has a mesh size of 2" or larger. 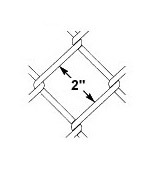 This means that they will typically work well with a 12 gauge, 11-1/2 gauge, 11 gauge, 9 gauge, or 6 gauge chain link fence mesh. It is best to double check your mesh size before ordering.